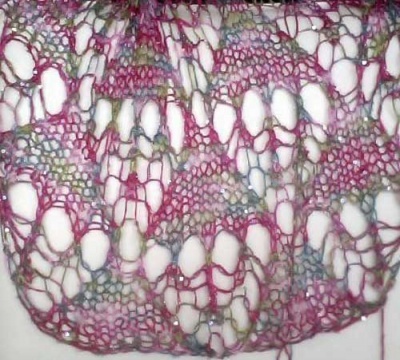 Beaded Silk & Sequins skeins dyed in Cherry Blossoms. 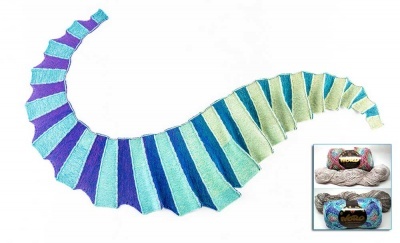 The designs that follow use patterns that require just one skein of the Beaded Silk & Sequins (booklet with 8 patterns). The photo that inspired the colorway. 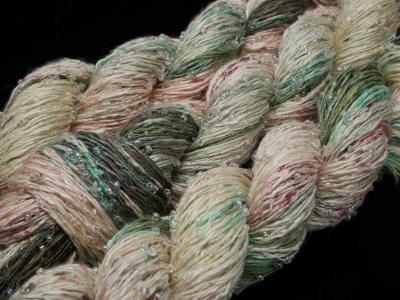 Only the Beaded Silk & Sequins skeins are currently in stock (yarn described below). 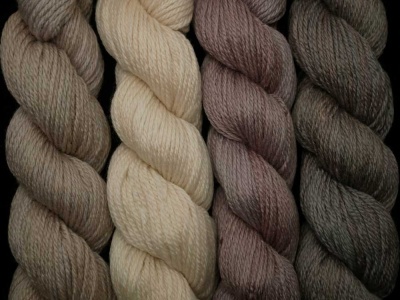 And take a look also at our new February offerings -- any of these Merino Cloud colorways would look great with this. This yarn is all that is left from the third installment of the Artyarns Merino Cloud Inspiration Club! Every two months we have been receiving a limited number of specially dyed yarns from ArtYarns. The colors are limited edition and exclusive. Cherry Blossoms was designed as a beautiful sign of Spring, the blooming of the 3,000+ cherry trees in Washington DC sparks the start of a festival that honors both American and Japanese cultures and reflects the bond between our countries which began with the gift of the trees from Tokyo's mayor back in 1912. 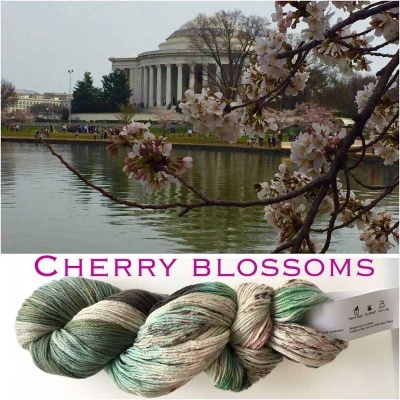 The colorway as created by Iris Schreier of ArtYarns is a wonderful mirror of the colors of the cherry trees in bloom. On a base of cream and almost-not-there-pale pink, sections of varous greens alternate with speckles and dashes of rose and fuchisa as well as some green. The greens range from pale through to a deep almost-black evergreen; the pinks are lovely highlights dotted just like cherry blossoms. Plus! Each month there are a numer of free patterns! Details follow. 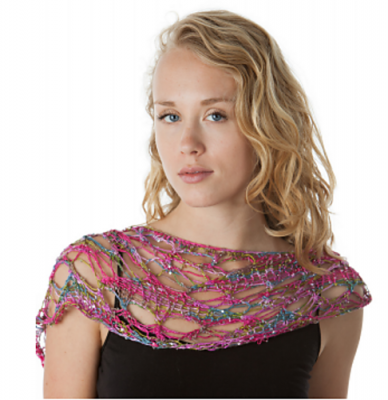 What we have left in this lovely colorway is Artyarns' Beaded Silk & Sequins with beads and sequins threaded into the yarn. 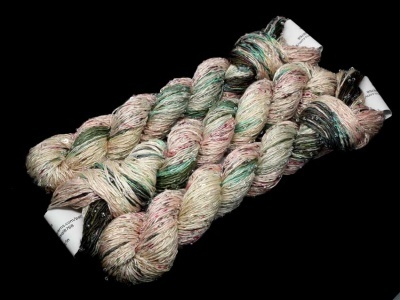 Each skein is 100% silk with glass beads and sequins and has 110 yards (100m) per 50g skein. 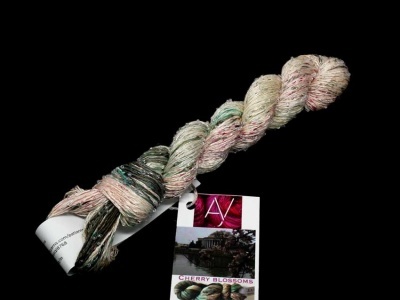 The price you see on this web page now is for one Beaded Silk & Sequins skein. The other yarn has sold out. The Cherry Blossom colorway is truly a limited colorway and won't be dyed again. There are a few patterns that we can send you that require only one skein of this lovely Beaded Silk & Sequins. 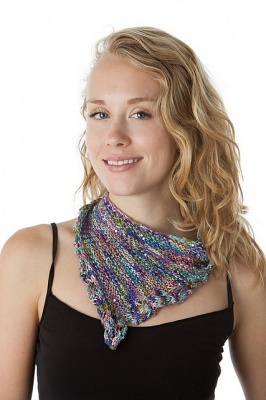 Glittery Iceberg Scarflette is designed to simply use one skein of the Beaded Silk & Sequins. There were also free patterns developed specifically with this colorway in mind but they all require some Merino Cloud which we no longer have. If you are curious, let me know and I'll send you photos.